A great seasonal tool for traditional chestnut roasting. Keep the tradition alive at your home with our chestnut roasting pan. great for the wood fired oven, fire place, BBQ grill or campfire. The Wildwood chestnut roasting pan has a broad shallow surface which provides for the perfect roasting of chestnuts. It has large perforations which allows for significant flame contact, enhancing the roasted, smoky flavor. It is made of black carbon steel with an iron handle, shallow surface allows for the roasting of chestnuts. It has large perforations which allows for significant flame contact, enhancing the roasted, smoky flavor. 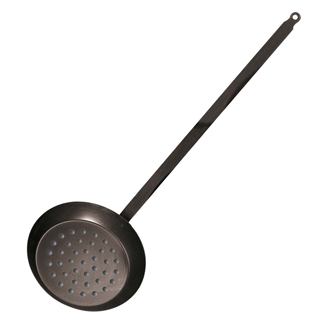 It is made of black carbon steel with an iron handle.